The chrysoberyl (pronounced kris-o-bear-al) gemstone family is one of the most underrated in the jewelry world. Many people have heard of the “phenomenal” members of the Chrysoberyl family, like Alexandrite or Cat’s Eye, but these are just two members of a very beautiful and important gem group. All Chrysoberyls share several traits that make them excellent jewelry stones. First and foremost they are a very high 8.5 on the Mohs Scale of Hardness and they are quite tough too. This means they can easily be set into jewelry and be worn on a daily basis without concern. They are also doubly refractive, coupled with a high refractive index, which produces superior sparkle and shine. Finally they are totally natural and untreated, making them a true rarity in today’s gem market. Below I will discuss the unique properties that differentiate the various Chrysoberyl family members. Alexandrite is the most famous chrysoberyl; known primarily as the birthstone for June. It is a very rare chromium-rich member of chrysoberyl family that, in fine qualities, exhibits a change of color phenomenon depending on the light source it is viewed under. It is often said that Alexandrite is “emerald by day, ruby by night” because they tend to be a teal or grass green under fluorescent or daylight and a raspberry or brownish red under incandescent or candle light. Alexandrite was named in honor of Tsar Alexander II because the first examples of Alexandrite were found in Russia in the 1870s- and the colors of the gem matched the red and green imperial colors of the Tsar. Due to their rarity and novelty they became quite popular in the late Victorian era and these early pieces are very collectable today. That first deposit in the Ural Mountains was largely exhausted by 1910, and the revolution of 1918 halted what production remained. Thus Russian Alexandrite is quite scarce and has a cult-like following in the jewelry world. 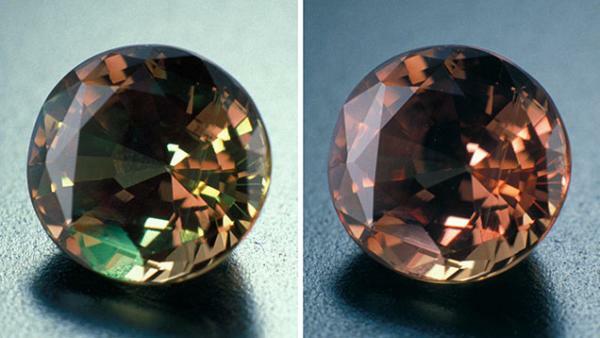 Alexandrite is graded first and foremost on the purity and intensity of the colors present. The more vivid and saturated the color, the more valuable the gem (like the above stone from Brazil). This means a higher price is paid for a stone with a deep teal green than one with a brownish green tone. The second most important factor is the strength of the color change- just how distinct the change is from green to red, and what percentage of the stone changes color –ideally 100% of the stone changes in appearance under different lighting conditions. Finally, one looks for stones that are clean to the naked eye and that are well cut. All natural alexandrites have flaws, but you want to find one where the flaws are very small or are hidden by the cutting. It should also be noted that size is an important factor in Alexandrite. Any stone over ¼ct is considered a solitaire size, the rarity increases exponentially at the ½ct and 1ct mark, and fine stones over 2cts are so rare we have never sold one! 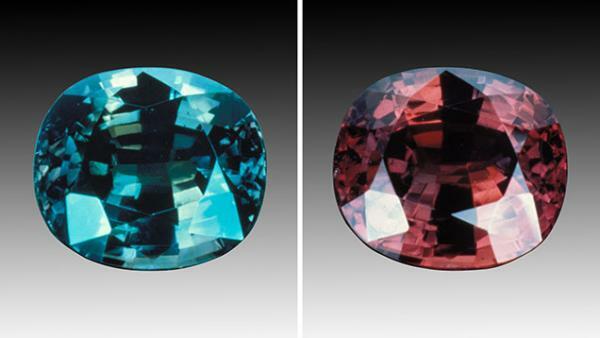 As with all colored gemstones, perfect specimens of Alexandrite are nearly impossible to find. The most common fault we see is low clarity. Some of the gems with the strongest color change are heavily included or foggy looking. Likewise the most beautiful gems will often display a strong green, but almost no red in the color change, or will be too light in tone to view the phenomenon (the above stone shows little color change and has a brown undertone). One of our biggest pet peeves is when we see a fine gem that is natively cut to make the largest stone possible, as opposed to cutting the stone with precision to maximize brilliance and beauty. Thus we will frequently purchase Alexandrites with poor cuts or with a single large inclusion and then recut them to improve the brilliance of the gem. We carry Alexandrite primarily from deposits in Brazil and Sri Lanka. My favorites are Brazilian because they have a color intensity that is rivalled only by the finest Russian stones. They tend to be an intense teal and change to a reddish purple, and they often have very strong color changes. The Sri Lankan stones are important because they can often be found in larger sizes, and they come in colors that are a little lighter in tone, which some clients prefer. The new finds in Tanzania and Madagascar tend to be light in tone, and do not have strong color changes, but we are watching the market closely to see if this changes. In terms of raw quantity India is today’s most important source of Alexandrite, but most of these are very small and too included for our use (many of the Indian stones also show a cat’s eye effect, like the below stone). A note on synthetics and lab-grown alexandrite: the majority of “Alexandrites” sold in jewelry stores are a form of synthetic. Laboratories have been producing synthetic spinel and sapphire that perform a moderate change of color from blue or teal to purple for over 100 years (we even see expensive antique platinum and diamond mountings with synthetic stones in them). Due to the fact that these don’t look authentic we do not recommend purchasing them. However, labs in Russia are now producing synthetic Alexandrite (chemically identical to the natural, but grown in a lab) with a change of color similar to Brazilian and Russian natural stones and we can order these for clients on request. If you are curious about the authenticity of an Alexandrite, the best thing is to have a laboratory test the stone. But if you are simply curious, the following list of red flags are things that typically indicate that the stone is not natural in origin: stones larger than 1.5ct (or ¼ inch in diameter); stones with a blue undertone; stones that are strongly fluorescent; stones that are flawless under a microscope; stones set in 10k gold or 925 sterling silver mountings; and stones that were purchased overseas. Cat’s Eye Chrysoberyl (before 1900, known as Cymophane) shows a phenomenon that is just as fascinating as the color change in Alexandrite. 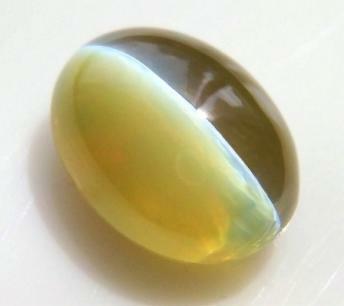 Cat’s Eye is always cut en cabochon, and when a ray of light hits the stone, it forms a roving white sheen over the surface of the gem: reminiscent of the contracted pupil of an eye. This captivating phenomenon is known as chatoyancy. The mineral composition of Cat’s Eye is the same as Alexandrite, but the stones have one key difference: the presence of silky, fibrous inclusions within the gem. Upon inspection under a microscope it would be observed that these inclusions take two forms. They can either be very thin and fibrous strands, like hair, or they can be minute hollow tubes. 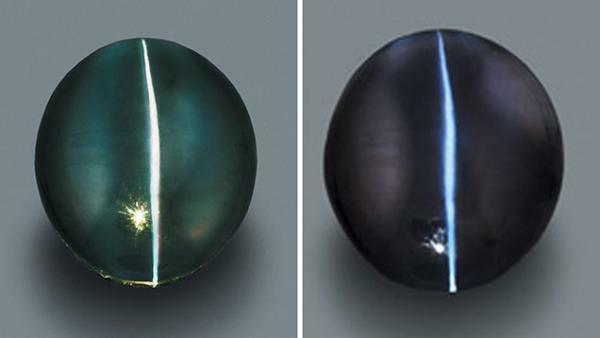 In either case when these inclusions run parallel to each other within the gem they interfere with rays of light hitting the stone, resulting in a cat’s eye perpendicular to the direction of the inclusions. Typically speaking, when these inclusions are tightly and uniformly packed together it results in stronger and more perfect chatoyancy- like the two gems above. Grading Cat’s Eye is quite straightforward: it’s all about the eye! The most valued Cat’s Eye gems show a strong white eye, perfectly centered within the gem, with an even intensity along its length, and that is sharp and defined under direct light. Even more valuable are gems that display a “milk and honey effect” which occurs when the eye is a dividing line, showing a translucent glow on one side and a foggy look on the other in certain lighting conditions. Generally speaking, golden brown and bright yellow stones that are fully translucent and free of distracting flaws are the most valued, though dark brown, white or green stones can also be very beautiful. As stated above, it is possible for a stone to be a Cat’s Eye Alexandrite, meaning it is a double phenomenon gem exhibiting change of color and chatoyancy, but these are quite rare and are treasured by gem collectors. 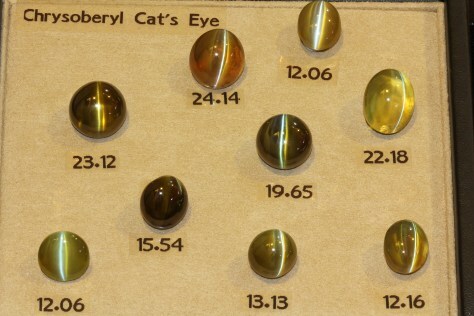 The below suite of cat’s eye gems displays the range of color they are commonly found in. Cat’s Eye is the sign of the Ketu moon which represents enlightenment. Thus Hindi people have treasured Cat’s Eye as a talisman against evil and bigotry, and it is still worn today. It became popular in Europe in the 1700s when fantastic specimens were acquired from the collections of Mughals and rulers in southern Asia, then re-set in jewelry for royalty. In the Victorian era the Cat’s Eye effect was seen as the embodiment of the “all seeing eye” of god, and was thought to protect the wearer from harm. They reached their peak of popularity when the Duke of Connaught, the younger son of Queen Victoria, gave a Cat’s Eye to his fiancé as an engagement ring. 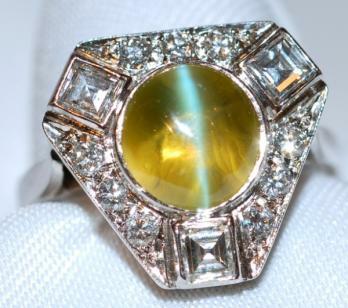 These high-profile gifts of Cat’s Eye cemented them as one of the premier colored gemstones, and they are coveted around the globe today. It should be noted that Cat’s Eye Chrysoberyl is the only gemstone that can be referred to as “Cat’s Eye” without the mineral name included, and all other stones that have chatoyancy must include their mineral name, like cats eye tourmaline or cats eye fibrolite. Due to its rarity and value, Cat’s Eye is frequently imitated by lab grown synthetics, as well as Tiger Eye Quartz, but there is no substitute for the gemmy glow and strong eye of the original. 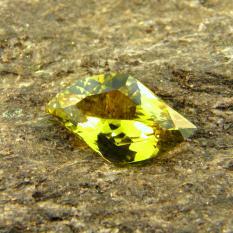 When chrysoberyl does not show a phenomenon it is known as Chrysolite, or simply as Fancy Chrysoberyl. This species is a particular favorite of our store owner who loves the brilliance of these gems, and the affordable price! The fancy colors of Chrysoberyl have been really gaining in popularity over the past decade, as demand for untreated gemstones increases. In fact the golden brown, yellow, olive green, and mint green colors found in chrysoberyl are quite beautiful and need no enhancement beyond precision cutting to show their beauty (the above three stones from our inventory show the range from light to dark). 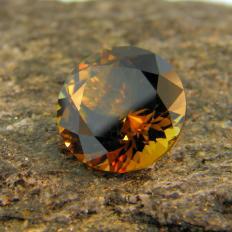 Just like its more famous siblings, Fancy Chrysoberyl is mined primarily in Brazil, East Africa, Sri Lanka and India. The oldest known mines are in Sri Lanka, and these gems followed the ancient highways and the Silk Road before entering Syria, Turkey and the rest of Europe. In fact, golden Chrysoberyl came to represent Simeon, one of the twelve tribes of Israel, and thus the stone was frequently worn by Rabbis as a talisman. At some point in the Middle Ages it became popular with other religons, thus one can see many ancient ornaments in cathedrals and museums across Europe that feature Chrysoberyl. Among the fancy colors of chrysoberyl there are two standouts that deserve special attention. The first is a discovery of mint green chrysoberyl in Tanzania in the 1990s (above left). 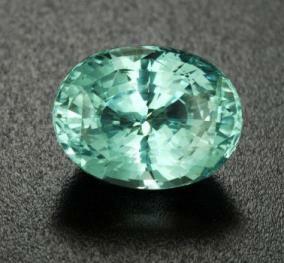 Upon first look gemologists thought they were looking at Grossular Garnet or Paraiba Tourmaline, but close inspection revealed a new type of chrysoberyl that owes its unique color to traces of vanadium- the same element that gives some Emeralds a blue undertone. 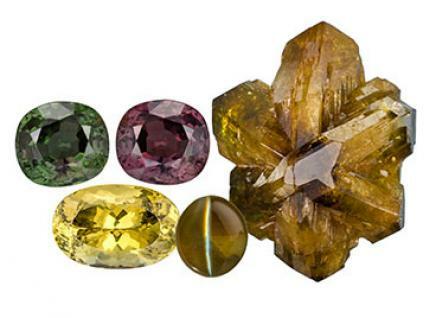 When it colors Chrysoberyl the result is dramatic- and these stones are in high demand among collectors today. 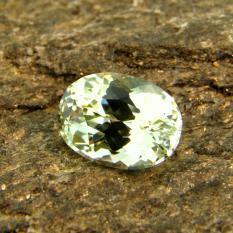 The other Chrysoberyl discovery of note are the “Neon Chrysoberyls” discovered in Orissa, India in the early 2000s (above right). 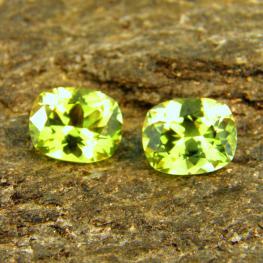 This material is a bright, intense highlighter yellow or chartreuse color that is simply unrivaled in the gem world. They are more intense than yellow diamonds, brighter than yellow sapphires, and absolutely when set in jewelry. While these stones are quite rare, we try our best to keep a couple of these rare gems on hand for collectors or lovers of yellow gemstones. Feel free to stop by our store to learn even more about chrysoberyl, or to see some of these amazing gems in person.